There is a perversely delicious irony about politics. Overtime it shows the flaws, exposes the hypocrisies and displays the duplicitousness of its gods. After the BJP-led NDA came to power in 2014, constituents of the Sangh Parivar have been shrill in espousing the cause of homecoming or ‘ghar wapsi’. On July 5,2015, the Vishwa Hindu Parishad (VHP) proudly claimed that it had brought back 33,975 people to their ‘original faith’ and a total of 48,651 people were ‘prevented’ from being converted to other religions by the organization during the last one year. This affiliate of the RSS had claimed huge success in it’s endeavour at its annual meeting in Rajasthan’s Bhilwara last year. The report also pointed out that ”the organization arranged marriages for 284 girls belonging to the minority community in Gujarat,while 7,776 were given Sanskrit diksha and 49 sisters from Uttarakhand were brought back to their original religion.” All the figures pertained to the period between June 2014 and June 2015. Prime Minister Narendra Modi assumed office on May 26, 2014. And as the party in power parades it’s large-heartedness in granting Indian citizenship to the high profile Pakistani singer Adnan Sami, comes news that over 50,000 hindus-citizens of Pakistan, who have been in Gujarat for over three decades on a long-term visa, have no respite in sight. Indian citizenship still eludes them. Hope springs eternally in the human heart and these people who came to India hoping for a new dawn in their lives are frustrated and bitter. “Ghar-wapasi, what homecoming? We are Hindus, we came of our own volition hoping to be welcomed. Look at our plight. We step out of Ahmedabad trying to earn for a living and police slaps cases on us”, points out one of them speaking on condition of anonymity, and all this in the home state of the ‘Hindu Hriday Samrat’ (king-saviour of the hindus), who happens to be the country’s Prime Minister. By last count there are over 50,000 hindu-citizens of Pakistan who sought solace in various parts of Gujarat-for a variety of reasons-over the last forty five years. The predominant movement took place after the 1971 conflict between the two countries. They have been appealing, pleading and begging before the government for Indian citizenship, but so far, by and large, in vain. According to the foreigners division of the Gujarat Police, there are at least 10,000 people staying in Ahmedabad alone. Partition sliced larger Sindh. The Indian part is Kutch and the Pakistani part Sindh. As in other parts of the country, there was large-scale migration in this part as well .Among the big names who migrated to India from Sindh during partition and first found home in Kutch were the former deputy prime minister and BJP veteran LK Advani. 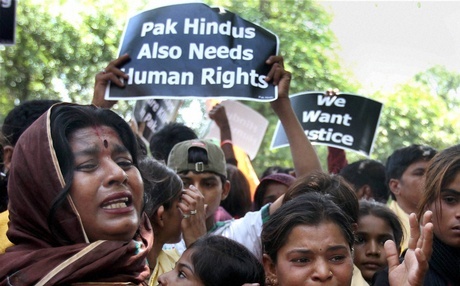 However, a fairly large population of Hindus chose to stay back in the Pakistani part. Many of them slowly trickled back to Gujarat over the years. These Hindus, though permitted to stay, do not propose to return and have been begging and imploring the government to be given Indian citizenship. Modi during his almost 13 year long tenure as chief minister of the state had heightened their expectations. The common excuse then trotted out was that the state government was receptive to their plight but the final decision rested with the Centre. “So it was that when he took over at the helm of the government of India, we felt that it was just a matter of days that the problem would be sorted. But it is nearing two years of BJP rule but there is no relief in sight for us”, points out another of the migrants now based in Ahmedabad. While the RSS-VHP chases ‘ghar-wapsi’ in India, the fact is that about 100 of these Hindus who had come ’home’ have gone back to Pakistan after staying long years in India out of sheer frustration at the red tape, lethargy and rank corruption prevailing in the administration and holding up the process .Many more are packing their bags and will be gone soon. Rambhai Bhimani, president of the Ahmedabad Thara Lohana Samaj, confirms it. There are over 3,000 applications lying with the Ahmedabad district collector’s office alone, but the tragedy is that these are just nobody’s priority. A large number of these migrated Hindus are staying with relatives and friends in Sardarnagar and Kubernagar areas of Ahmedabad where most of the Hindus who came from Sindh during partition have settled down. The fact is that a migrant Pakistani can apply for Indian citizenship only after seven years of stay but is not allowed to buy property or start his own business. He is not allowed to move out of the district for this period and must do so only after seeking permission from the district administration. Interestingly, a child born to such parents has to wait for 14 years before he is even eligible to apply for Indian citizenship. Education, for such children, is a very complicated and tiring process and there are countless tales of hardships and harassment one hears as one tries to talk to them. And there are almost 8000 such children whose fate and future hangs in the hands of the bureaucracy. Last year, a special camp was held by the Union home ministry to take up cases for grant of Indian citizenship, wherein of the total 87 taken up only 50 were recommended for approval. Most say that it was fears of religious conversion, forced marriages and even abductions that saw most move seeking comfort amongst’ our own’ but are battling disillusionment now . A word of advice: Vote for the man who promises the least. It will be least disappointing. And Ghar-wapsi – my foot!